Please refer to our stock # 11220 when inquiring. 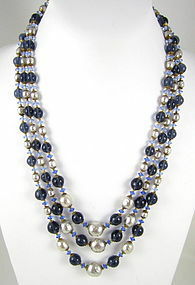 This beautiful vintage necklace by Miriam Haskell is handcrafted from light blue glass beads and glass baroque pearls. It is 21" long from end to end and is approximately 2" wide in front. It has a 1/2" diameter button clasp with wire work beading on top and it is signed "Miriam Haskell" on the reverse. One of the large center pearls has a small nick to the surface, but other than that it is in very good condition.